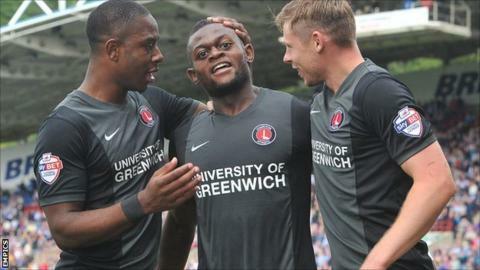 Igor Vetokele's injury-time equaliser saved Charlton's unbeaten record in a thrilling draw with Huddersfield. Huddersfield's Murray Wallace saw red before the break for bringing down Vetokele outside the box before Nahki Wells tapped in a Tommy Smith cross. Referee Tim Robinson then turned down Huddersfield penalty claims when James Vaughan was felled by Tal Ben Haim. And Charlton levelled soon after when Vetokele rifled home in the second of five minutes of added time. Wells had an early effort ruled out for a foul and he was later denied a decent opportunity after latching onto a poor backpass, only for Ben Haim to make a last-ditch goal-saving tackle. Addicks keeper Nick Pope then denied Lee Peltier and Harry Bunn before keeping hold of a fierce drive from Paul Dixon on 31 minutes. At the other end, Vetokele had a goal ruled out for offside on 21 minutes before twice going close when he rounded Alex Smithies but was tackled by Wallace before seeing the keeper tip his powerful drive over for a corner. Wallace saw red in first-half stoppage time after bringing down Vetokele on the edge of the box even though the Town defender had Tommy Smith and Joel Lynch covering. However, it seemed to fire up Huddersfield, and they took the lead through Wells during a spell of pressure in which Conor Coady headed just wide from a Bunn cross. Vaughan forced Pope into a another great save on 67 minutes while at the other end Johann Gudmundsson nearly levelled with low shot which flashed just wide before the late drama. Huddersfield caretaker boss Mark Lillis said: "I think it [the red card] was a bit harsh. Joel Lynch was there so [Murray Wallace] is not the last man and I think we will appeal. "I was disappointed with that decision and a few other decisions the referee made for both sides." Charlton head coach Bob Peeters said: "We are happy to remain unbeaten but Huddersfield did very well. If anyone deserved to win this game it was Huddersfield. "They threw everything at us for 10 or 15 minutes at the start of the second half and we got nervous and stopped playing the ball." Match ends, Huddersfield Town 1, Charlton Athletic 1. Second Half ends, Huddersfield Town 1, Charlton Athletic 1. Attempt missed. Simon Church (Charlton Athletic) header from the centre of the box is close, but misses the top right corner. Assisted by Chris Solly with a cross. Corner, Huddersfield Town. Conceded by André Bikey. Attempt blocked. Adam Hammill (Huddersfield Town) right footed shot from outside the box is blocked. Goal! Huddersfield Town 1, Charlton Athletic 1. Igor Vetokele (Charlton Athletic) left footed shot from the centre of the box to the bottom right corner. Assisted by André Bikey with a headed pass. Corner, Charlton Athletic. Conceded by Alex Smithies. Attempt blocked. Callum Harriott (Charlton Athletic) right footed shot from the left side of the box is blocked. Attempt blocked. André Bikey (Charlton Athletic) header from the centre of the box is blocked. Assisted by Chris Solly with a cross. Substitution, Huddersfield Town. Adam Hammill replaces Sean Scannell. Attempt saved. Johnnie Jackson (Charlton Athletic) left footed shot from outside the box is saved in the centre of the goal. Assisted by Tal Ben Haim. James Vaughan (Huddersfield Town) wins a free kick on the left wing. Delay in match Alex Smithies (Huddersfield Town) because of an injury. Corner, Charlton Athletic. Conceded by James Vaughan. Corner, Charlton Athletic. Conceded by Paul Dixon. Foul by James Vaughan (Huddersfield Town). Corner, Charlton Athletic. Conceded by Conor Coady. Attempt saved. James Vaughan (Huddersfield Town) right footed shot from the right side of the box is saved in the top centre of the goal. Assisted by Tommy Smith. Substitution, Charlton Athletic. Callum Harriott replaces Jordan Cousins. Corner, Huddersfield Town. Conceded by Johnnie Jackson. Attempt blocked. Tommy Smith (Huddersfield Town) right footed shot from outside the box is blocked. Assisted by Jacob Butterfield. Attempt blocked. Harry Bunn (Huddersfield Town) right footed shot from the centre of the box is blocked. Assisted by James Vaughan. Substitution, Charlton Athletic. Simon Church replaces Rhoys Wiggins. Attempt missed. Johnnie Jackson (Charlton Athletic) left footed shot from outside the box is close, but misses to the right. Attempt blocked. Jordan Cousins (Charlton Athletic) right footed shot from long range on the left is blocked. Assisted by Johnnie Jackson. Substitution, Huddersfield Town. James Vaughan replaces Nahki Wells. Substitution, Huddersfield Town. Radoslaw Majewski replaces Lee Peltier. Attempt missed. Conor Coady (Huddersfield Town) header from the centre of the box misses to the right. Assisted by Harry Bunn with a cross.